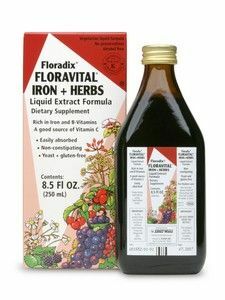 Floradix Iron & Herbs provides a very highly absorbable form of iron and combines it with B-Vitamins, Vitamin C, digestive herbs, specially cultured nutritional yeast (Saccharomyces cerevisiae), plus ocean kelp and extracts of wheat germ and rosehip. 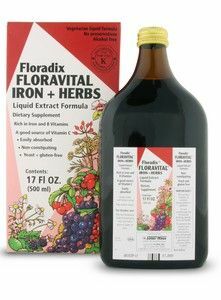 Floradix Iron + Herbs offers nutrients required for proper growth, energy, and for maintaining optimum health. 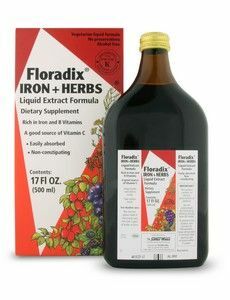 All family members can enjoy the health benefits of this liquid formulation. 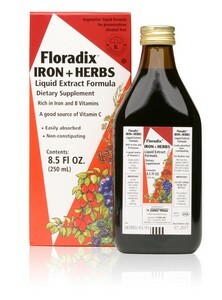 Unlike other iron products, Floradix Iron & Herbs is non constipating. Question: Is it safe for pregnant women? and currently taking iron supplement?thanks! A: There are no warnings against taking this iron supplement if you are pregnant however it is always a good idea to let your physician know of what supplements you are taking. A: Iodine is not listed as an ingredient or mineral in this product. As with any supplement, it is always a good idea to run it by your physician, especially if you have any medical conditions.